It seems that the distributors may have underestimated the popularity of the surviving 20 minutes or so of what could very well be the world’s first feature length narrative film. 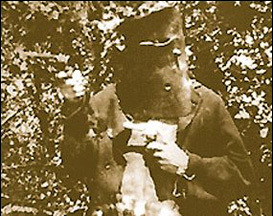 Recently released in a juicy box set to celebrate its centenary, The Story of The Kelly Gang comes with a monograph containing as much information as you’re ever likely to need on the subject and a rockin’ new experimental sound track by Endorphin. But the initial run has already sold out. Produced just twenty-five years after the real life events, this remarkable film initially ran somewhere between 60 and 80 minutes, depending on how fast the old hand operated projector was cranked. The fragments that have been restored by the National Film and Sound Archive came from sources as varied as the estate of an old film collector and a rubbish tip in rural Victoria. Thankfully there is enough existing material to get an idea of the sweeping arc of the story despite the condition of some of the more deteriorated images. In fact these scenes take on a sort of surreal quality, especially when Ned, clad in what could very well be Kelly’s own original armour, comes storming towards camera with guns blazing only to be wounded and taken prisoner by the troopers. It’s as if the burned out nitrate stains that obscure most of the action somehow represent the obliteration of his fighting spirit. But can it ever truly be extinguished? Authorities have tried. Six years after the first screening of this film, legislation was introduced banning bushranger films altogether and it was only in the late 1940s that it was eventually revoked. Since then the old outlaw has had several reincarnations, most recently in the hands of Heath Ledger. As Ned himself famously proclaimed before being hanged, “Such is life”.